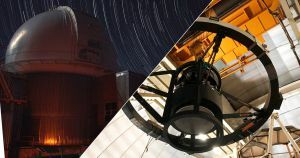 The world’s most detailed 3D map of the universe will be here soon, thanks to new upgrades at Arizona’s Kitt Peak National Observatory. The new component, called the Dark Energy Spectroscopic Instrument (DESI), was installed Wednesday. Pending further construction expected to finish in 2019, DESI will begin a five-year sweep of the night sky. It’ll measure how the universe has expanded over time and collect better data about dark energy, the mysterious force that makes up much of the universe and actively causes its expansion. DESI’s sensors will investigate a phenomenon called red shift. Just like how an ambulance’s siren seems to change pitch as it passes you, light seems to shift frequencies depending on whether its source is moving towards or away from you. As galaxies move away from terrestrial observatories, the tint of the light shifts towards the red side of the electromagnetic spectrum, depending on how fast they’re moving. Other tools exploit the same phenomenon, but DESI will do it best. DESI will align 5,000 tiny fiber optic cables to pick up light from 35 million distant galaxies in high resolution. As dark energy’s constant shoving moves those galaxies move away, DESI will be pick up on just how fast they’re moving, giving scientists more precise measurements of dark energy’s impact on the universe than have ever been collected in the past. Scientists will use those measurements to learn more about how our universe developed, as well as where it’s going in the future.